Drive a fleet of Supercars worth more than $2 Million Dollars! INCLUDES PASSENGER SPACE! The ultimate day out in Sydney. Test drive a fleet of Supercars - INCLUDES PASSENGER! Start your engines – this is the best gift for any car fan. 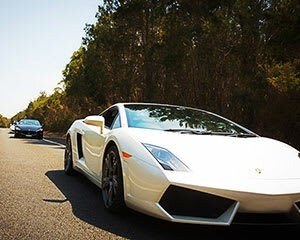 If they want to experience the Top Gear lifestyle for themselves, this Supercar Drive Day is the perfect gift. This package includes a non-driving passenger, so you (or someone else equally as lucky!) can travel with the driver and share the experience! Exit the showroom then swoop along the scenic coastal route to Wollongong, taking in Stanwell Tops and the spectacular Sea Cliff Bridge along the way. On arrival you'll have a vehicle briefing, sign some forms and look at the route maps before being issued the keys to the first car of the day - whereupon you'll follow your lead driver out of the garage and hit the road. You'll swap cars throughout to make sure you all have a chance to drive all of the vehicles. You'll stop for a well-earned lunch at Wollongong before taking some time for the obligatory photoshoot of all the cars together. Then it's back on the road for the return journey - you'll be back to the garage by around 5pm. This experience is for 2 people; 1 driver and 1 non-driving passenger. Minimum age of 25 applies to drivers. Super Car Tours run from 9:00 AM to 4:00 PM on selected weekdays. Cars may vary on the day depending on mechanical or logistical issues, but usually include Ferrari, Lamborghini Gallardo, Ford Mustang GT, Maserati Granturismo, Nissan R35 GT-R, Porsche 911 997 Carrera, Lotus Evora S, Alfa Romeo 4C and more. Where a substitution is made, every effort to use a car of similar value will be made. Excess applies for at-fault incidents. Customers may opt to pay a $99 excess reduction fee on the day of their drive to limit liability to $5,000. Really happy with the day overall, a great experience and great food as well. Would love to rebook in the near future! Thank you!!! This was a fantastic day. My wife bought me this as a 50th Birthday present and we both had a fantastic time. The staff were great and the whole day with a fantastic lunch by the Wollongong harbour was brilliant. Recommend it to anyone who loves motor cars. Awesome and thanks guys. The grin on my face when Sid handed me the Ferrari keys last all day. Simply amazing! The day lived up to expectations, with each supercar giving its own unique thrill. Had the best day out with my dad on the supercar drive day. Those cars an insane and will remember the experience for a long time. We couldn't be happier with the drive day it was awesome. My husband had a great experience driving the cars and the staff we amazing. Would highly recommend it. I TOTALLY enjoyed the whole day. However, I didn't think the Lotus belonged in the group at the expense of the Ferrari, Maclaren and Maserati. Thankfully I was so taken by the Audi R8, I'm still smiling. The guys - Sid and Senan were amazing, very customer focused, they made the whole carry a pleasure.